A cross between Schindler's List and Robin Hood: Prince of Thieves, Defiance is the true story of the battlin' brothers Bielski. They saved the lives of 1200 Russian Jews by shepherding them out of the ghettos, outlasting the Nazis for years in the forests. 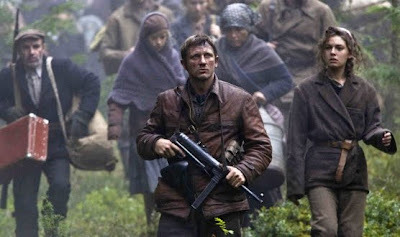 Daniel Craig, Liev Schreiber, and Jamie Bell play the three Bielski brothers. Everything they do, they do it for Jews. When Craig romances Alexa Davalos in the forests, I half expected to hear the Bryan Adams song. Joking aside, Defiance's screenplay feels sloppy and unfinished. Numerous times, subjects are pointedly mentioned, telegraphed, and then hammered home immediately: Pregnancy is forbidden in the camp, so a character quickly is discovered to be pregnant. An elderly scholar teaches the children in the camp the story of Moses - right before the camp is attacked by Nazis and Daniel Craig has literally act like Moses and lead the survivors across the Red Sea/green swamp. The conflicts and changes of heart of the main characters are so predictable, at one crucial point Schreiber might as well have looked right at the camera and announced he would save the day right when he's needed the most. Though earnest and well-meaning, Defiance looks and feels like a TV movie that just happens to star James Bond and Sabretooth.